Published on February 26, 2011 in Bands/Artists, Downloads, Music, Retail and Vinyl. 0 Comments Tags: 7", Antibalas, dave sitek, electric cowbell, fela!, stay gold studio, stuart bogie, Superhuman happiness, tv on the radio, upcoming release, Vinyl. One thing is certain, Stuart Bogie is a busy dude. Just a quick look over his bio and you see an impressive list of bands he has recorded with and performed with including steady gigs in Antibalas, Iron & Wine, TV on the Radio, plus any number of acts related to those. It’s pretty obvious that he is a very in-demand horn player in the indie music space. So, you might not think that he would have time to have his own project. But, he does. It’s called Superhuman Happiness. Bogie started work on the first release by Superhuman Happiness on the heels of a long tour with Antibalas. A Christmas gift for his family, Fall Down Seven Times Stand Up Eight released in 2008 was a collection of songs that he had been working on for ten years. In July, 2010 Bogie released a super-limited 7″ of “GMYL” b/w “Hounds” which sold out very quickly. “GMYL” stands for the joyous refrain “God Makes You Live” in the hooky sax driven afro-rhythmic head-bobber. The single was recorded at Dave Sitek‘s (of TV on the Radio) Williamsburg studio Stay Gold. Some of the upbeat happiness of the tracks have to do with the fact that Bogie starts the compositions with handclap exercises to establish the rhythm– no sad songs based on hand clap rhythm- right? On March 1st the single is going to be reissued by Electric Cowbell records with new label and a colorful sleeve (one side pictured above). Electric Cowbell is a cool singles-only label located in Brooklyn. I recommend you check their site out and try to score some of their releases! Superhuman Happiness shared a now-out-of-print single with the incredible CSC Funk Band. 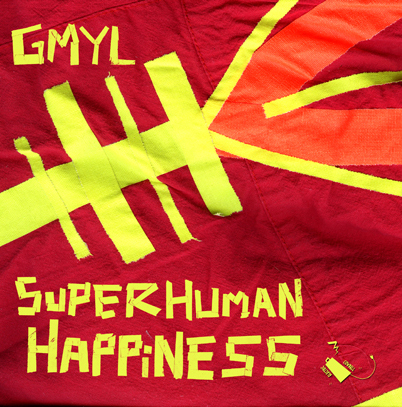 In addition to the “GMYL” single, Electric Cowbell released a collaboration between Superhuman Happiness and Sahr Ngaujah, “Gravity” b/w “String Theory.” Sahr performed the part of Fela Kuti in the “Fela!” Broadway show that Antibalas scored and Bogie performed music for. This single is worth checking out as well. For the record geeks: I compared both the original 7″ and the Electric Cowbell release of “GMYL” and they share the same master plates as they have the same matrix information. SHH-002A/B and U-6368IM-A/B are in the deadwax for both releases. Also scribed was “PCMJR” with a “U” in a circle. This is the marking for Mark Richardson of Prairie Cat Mastering out of Belvidere, IL. Coming up for Bogie and Superhuman Happiness is a couple more singles to come out this spring or this summer followed by another full length that is currently in early stages of production. Click Here for the Superhuman Happiness website. Click Here for Stuart Bogie’s website. Click Here for Electric Cowbell’s website. GMYL by Superhuman Happiness from Tatiana McCabe on Vimeo.